It's almost April, but snow is the forecast again for today! After relatively mild weather, we've paid for it this month, winter is here! But shows have already begun, so soon we will have green grass and outdoor fun! Club renewals have been slow in coming and May 1 is the deadline! Any club that does not renew by May 1 will be removed from our website. Please let me know if you have any questions! The Morgan Horse magazine has an offer to clubs! Ads in the "Farm and Service Directory" are for one year for just $100 (up to 40 words, no photos or logos, common type style). Contact stephen@morganhorse.com or kimo@morganhorse.com by April 17, 2017 if you are interested! National Day of the Morgan; We Want You! 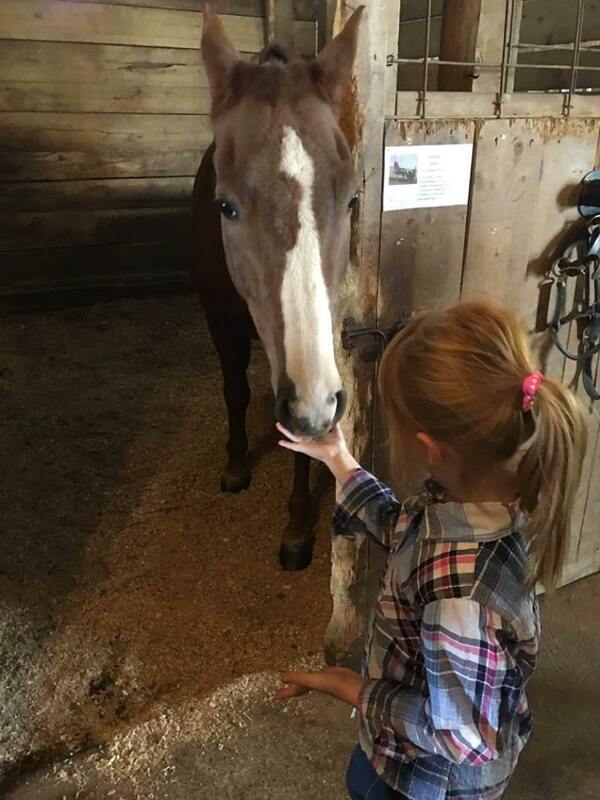 On a beautiful, sunny day last October, nearly 600 people were introduced to Morgan horses in an up close and personal way throughout the state of Ohio. Some of the ten barns involved in the Ohio Morgan Horse Association's Open Barn Day successfully signed up new clients for lessons and others were able to interest families in getting involved in the Morgan show world. All things considered, it was a great day for the Morgan horse industry and its success begged the question, "Why couldn't we do this type of promotion on a national level?" The answer was, "We can! And we will!" Accordingly, I am happy to announce that AMHA will be sponsoring a National Open Barn Day to be held on The Day of the Morgan, October 28, 2017. I have been asked to take on the challenge of heading up this very important event. But I cannot do it without you! The goal of this project is to promote Morgan horses on a national scale, coordinating local events targeting the non-horse public. Focusing on one day allows the AMHA to devote time and resources to publicize each participating stable's open barn, in their local area. Imagine what we could do in one day if you will all help reach our goal of 75 to 100 participating barns! On October 28, 2017, it is entirely possible that more than 5,000 people will experience the joy of a curious muzzle looking for treats, or the magnificence of a group of Morgan horses running across a field, or the awe inspiring sight of a park saddle horse performing his gaits. Try to remember the first time you saw a Morgan horse. That feeling has never gone away for me. And it's that feeling that has coursed through my veins for a lifetime of commitment to our breed. If we can provide that feeling for even a small percentage of the people we will reach, we will have accomplished a lot. We will have injected new blood into our industry, which we all know is a bit anemic right now. This needs to be a group effort, where each and every Morgan breeder, trainer, owner and rider realizes the consequences of doing nothing to promote the breed. If not now, why not? If not now, when? The way in which you choose to promote the breed on that day is also your choice. If you can do demonstrations, that's wonderful. If you are able to offer rides or drives, fabulous! If you just have a field full of beautiful Morgans, that's great, too. Whatever your stable's involvement, surely you can introduce a curious person or family to a Morgan horse. Even the hours you will be pen are up to you! Sharing your love and enthusiasm for the breed is what we need. Please download this sign-up form, fill it out, and send it me. More information will be coming soon. Whether you are a professional trainer, a breeder, a trail riding owner, a lesson program instructor or just someone with a couple of pet Morgans in your barn, WE NEED YOU TO PARTICIPATE! Why wait? Sign up right now! For more information, call me at (248) 207-4956. The American Morgan Horse Educational Charitable Trust (AMHECT) is pleased to offer two memorial grants for young adults under the age of 40. The Harry Sebring Memorial Grant is offered to all AMHA members under the age of 40 who would like to further his or her equine education, skills, or proficiency and/or provide equine-related experiences and education that will further the grant recipient's business endeavors. The Elberta Honstein Memorial Grant is a grant offered to all AMHA members under the age of 21 years old to further his or her equine education, skills, or proficiency, and/or further his or her academic education. Harry Sebring was a renowned Morgan horse trainer and the grant was created by his family in his memory, since he always wanted to see young adults excel personally and professionally in the show ring. Elberta Honstein and Roy-El Morgan Farm have a rich and long history with the Morgan breed. Roy-El Morgan Farm was founded in the early 1960s by Roy and Elberta Honstein. They passed on their love of Morgans to their daughter, Debbie, and then Debbie's daughters, Elberta Seybold and Erlene Seybold-Smythe. The farm still operates under the third generation to continue the tradition. Applications must be accompanied by a full proposal, budget details, and proofs of any material. Checks may not be made payable to the individual, but to the clinician, institution, or business providing the services. The 2017 Grant Application period opens on Wednesday, March 1, 2017 and will close at the end of the day (5 p.m. Eastern Time) on Sunday, April 30. Inquiries about grant applications or the grant process are handled by email only. Email execdir@morganhorse.com with any questions or comments. 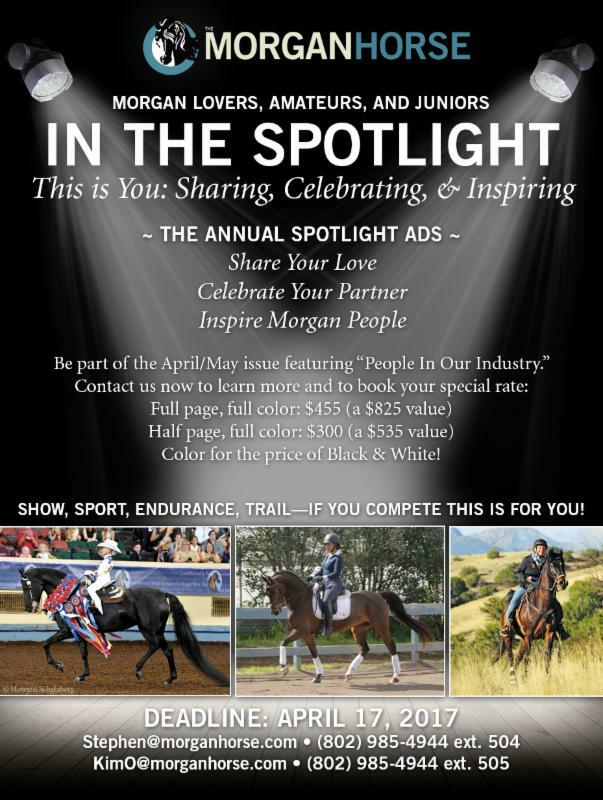 Attention Morgan lovers, amateurs, and juniors--be in the spotlight! Be part of the April/May issue featuring "People In Our Industry." Color for the price of Black & White! Show, sport, endurance, trail-if you compete, this is for you! Below is a letter to the American Morgan Horse Association's membership from its new president, Vicki Bennett. As your new President, I would like to take a few minutes of your time to introduce myself, talk a bit about the duties of your Board, and what's in store for 2017. However, before I do that, I want to compliment the outgoing Board and President Gove for its accomplishments on our behalf. The instigation and implementation of a strategic plan, along with the acquisition of a new software platform, leave us in a great position to improve services to us--the current members--and take advantage of the opportunities to gain new ones in what seems to be an improving economy. This has already been evidenced by eight consecutive months of growth in all of our Registry statistics! This Board is a diverse and strong one. There are long time show folk, Western and carriage competitors, owners of family farms and ranches, large and small. All of us are long term members who have volunteered our time and experience to guide the Association and its activities, enforce the rules and assure its financial integrity. Our fiscal responsibility is to all the members, current and future. We are all equal shareholders of AMHA. We are all also customers and we are improving our customer service this year. The implementation of the automation of member services will certainly do this for us. 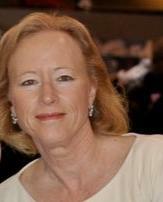 We all owe a huge debt of gratitude to member Sara Foy, who has initiated and guided this work from the beginning. There will be staff training in April and live testing in July. We will all need to be patient as we go through this important transition that benefits us all. My background is 30 years as a small business owner and as an AMHA amateur member, showing in both our breed shows and open competition. I have been a show mom, competitor, boarding barn owner, and small breeder. I grew up in Massachusetts and learned to ride, along with my daughter, at Orcland Farm in the 1980s. We showed in New England and at Nationals in those years. In the early 1990s. we relocated to Texas where I began to participate in competitive driving, and in a partnership with Dr. Hughes, bred some lovely sport Morgans. In the early 2000s I also evented with a Canabar gelding, who won several working hunter events at Nationals. In 2013, I was a founder of Morgan Safenet, a 501C3, which to date has recovered and returned over 200 Morgans to show, driving, endurance, and family homes. Today I am retired and live with my husband and several rescue dogs and horses in a small community East of Dallas. Morgans are still my passion, and I feel privileged to be able to devote much of my time to them and our members and the Association. Remember that every member is invited to call in to Board meetings and to ask questions, speak on topic, or raise new business. We will publish the dates, phone-in and agenda information, so that you can listen in and participate. 2017 has been designated as focusing on "Moving Forward"--let's all work together and keep moving forward in this positive direction! I encourage you to contact me with anything you'd like to share; suggestions and ideas, and comments and complaints. While we strongly urge all who are interested in the Morgan breed to subscribe to the official breed journal, every year The Morgan Horse magazine offers some of the magazine's content free of charge in our online archive. Recently we have posted the 2016 "Editor's Picks" along with all of Laura Behning's writing on Morgan colors. In addition, the epic series authored by Brenda Tippin on the genesis of our breed is available on a separate link known as "Figure and Sons." After you've whetted your curiosity with these articles, please consider a subscription to The Morgan Horse! In the fall of last year, Illinois State Fairgrounds officials deemed the historic Coliseum and the competition home of the Jubilee Regional Morgan Horse Show to be unsafe for exhibitors and animals. Since then plans to fix the structural problems have been slow going due to budget constraints and funding. This has left many shows in limbo but in the last month officials have released their plans and shows now have information to move forward. The great news is that the Jubilee Regional will be held at the Fairgrounds in Springfield and all of the stabling will remain the same. Improvements have been made in the stabling area with new and repaired roofs and better drainage. The show arena will be moved to the covered outdoor arena that was previously used for our dressage, trail, jumping and work arena. Fairgrounds officials have plans underway to put up walls around the arena making it better in inclement weather and adding seating to accommodate spectators. Future plans include adding air conditioning and heating in that area as well. This will become the main ring for the Fairgrounds until the Coliseum is back in working order. "Though we will miss the Coliseum, this fairgrounds is still one of the most horse and exhibitor friendly facilities in the country. We will continue to host a complete schedule, fun parties and incredibly beautiful Morgans and their riders," Jubilee President Betsy Bishop said. The show will go on beginning Wednesday morning, August 30th with the in-hand and performance classes with Kathleen Peeples of Oxford, NJ and Katie Mair of Howell, MI handling the judging assignments. "We are excited to have these two experienced horsewomen in center ring judging this year's show," Bishop added. The 9th Annual Morgan Weanling Gala will also showcase the offspring of 19 nominated stallions Friday evening following the performance session. The Gala made its home at the 2009 Jubilee and has grown and continued to offer a night of beautiful weanlings in a venue all its own. "Celebrating the labors of our Morgan breeders has deep roots at the Jubilee and The Gala has been a meaningful way to carry on that tradition," Bishop said. Championship classes and Jubilee Hall of Fame presentations will round out the 52nd Annual show on Saturday evening, September 2nd. "Our Morgan community is strong and although change can lead to uncertainty, we will guarantee the same spirit of friendship and competition at this year's show. We hope that our previous exhibitors will continue to support our show in our new show arena and welcome all new exhibitors." Bishop concluded. All show information, prize lists, sponsorship and entry forms can be found at www.jubileemorganhorseshow.com in the coming month. For questions prior to, please contact Show President Betsy Bishop at 217-836-5055, Make plans now to attend this year's show and close out a great summer show season with us in Springfield, IL. The Ranch Manager at the Pt. 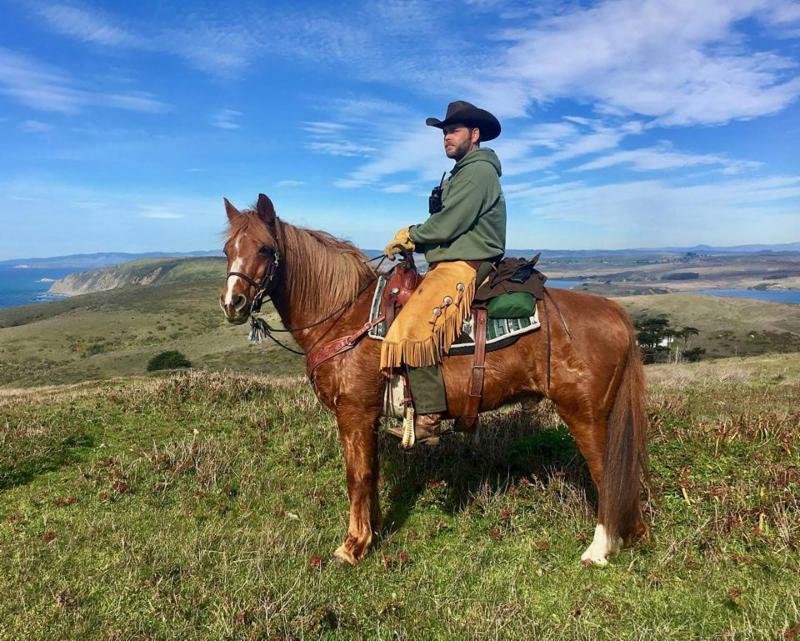 Reyes Morgan Horse Ranch in Point Reyes Station, California, has been authorized to begin searching for a new member to the Morgan family. The National Park Service has requested help from the Morgan community to get out the word what their requirements. Criteria: Purebred Morgan, between five to ten years old, 15.3 hands or taller, must pass a full vet check, a return policy of two to four months, must be at least green broke and suitable for the needs at the ranch (trail patrol, parades, good with other animals, good around people and pets, i.e. bombproof). MUST be 100% DONATION (tax-deductable). If you know of a Morgan/Morgan owner that meets the criteria, please email Philip Straub at philip_straub@nps.gov. He works Wednesday-Saturday. Are You Competing in 2017? Have Your AMHA Member Card Ready! According to US Equestrian (formerly USEF) rules, all owners (lessees), exhibitors, and trainers of horses participating at Federation licensed competitions in all Morgan sections must be current members (Standard or Premium) in good standing AMHA. If you are not an AMHA member, a non-member fee of $45 will be imposed on the exhibitor. A copy of your membership card must be submitted with all show entries. Don't have a copy? It's easy to download one from our website. Go to http://www.morganhorse.com/membership/cards to download it today. The 2016 Financial Statements and Auditor's Report are also available on the "Members Only" side of the website.